Speed between China and Japan’s most stunning attractions with this two-week bullet train tour. You will explore the ancient and modern marvels of China, from the Bird’s Nest Stadium to the Great Wall, the Terracotta Warriors to Shanghai’s Bund, using the country’s ultra-modern high-speed rail network. The trip then continues to Japan, where you will use the iconic Shinkansen bullet trains to rocket from the charming ancient city of Kyoto to the pulsating capital, Tokyo. You’ll be welcomed at the airport by your guide and taken to your hotel of choice. This fascinating place has become a thriving metropolis in recent years, and was brought back to the attention of everyone on the world stage in 2008 when it hosted the Olympic Games. As you enjoy the ride to the hotel, you will notice the “Bird’s Nest”, the modern stadium now recognised as one of the symbols of modern China and a triumph of architecture and the involvement of Ai Weiwei, the well-known Chinese artist. Rest of the day at leisure. Overnight in Beijing. Your day will begin very early, but you will likely forget this inconvenience when you enter the Temple of heaven. At this time of the day, you will see the various activities the Chinese do in the morning. Tai Qi, Kung Fu, sabre practice, meditation, tango, and gymnastics are just some of them. The Chinese like to prepare for their day with physical exercises that they consider essential for their health. As well, some Chinese practice calligraphy with giant brushes and water on the park’s flagstones that aesthetically pleases for as long as the water evaporates. Next, you will discover the Temple itself and its simplicity in structure. Its hidden symbolism hints at beliefs even more ancient than Buddhism and Taoism and to a time when the Emperor was considered the direct authority on earth from the heavens. You will then head over to the Forbidden City. Most Chinese buildings face south, which according to ancient beliefs symbolized the barbarian threat and potential invasion from the north. This explains why the main entrance to the Forbidden City faces south towards Tiananmen Square, the third largest city square in the world. According to legend the Forbidden City is made up of 9999 different rooms. 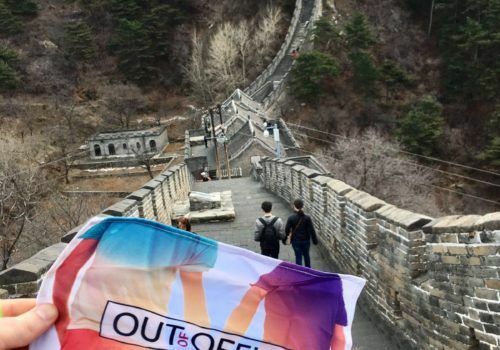 You will then climb the artificial Coal hill just behind the Forbidden City which provides a spectacular view of the entire area and lets you get a grasp of the whole of Beijing. Afterwards, you will finish your day with a refreshing change of decor and ambiance in the Wangfujing neighborhood, home to the famous Wangfujing road, the most commercial area of the capital. While you are there, you will get the opportunity to witness how modern China has become and how its fierce consumerism continues. Next door, the Donghuamen Market offers a delightful taste of the night markets in the city. No one in the whole world yells as loud as the wonton vendors in Donghuamen. Even though people like to falsely claim that it is visible from the moon, the Great Wall is one of the most important symbols of the country and must be visited. Bright and early in the morning, you will depart from your hotel to visit the Mutianyu section of the Wall. Once you are there, you can benefit from the early morning sunrise in your photographs. 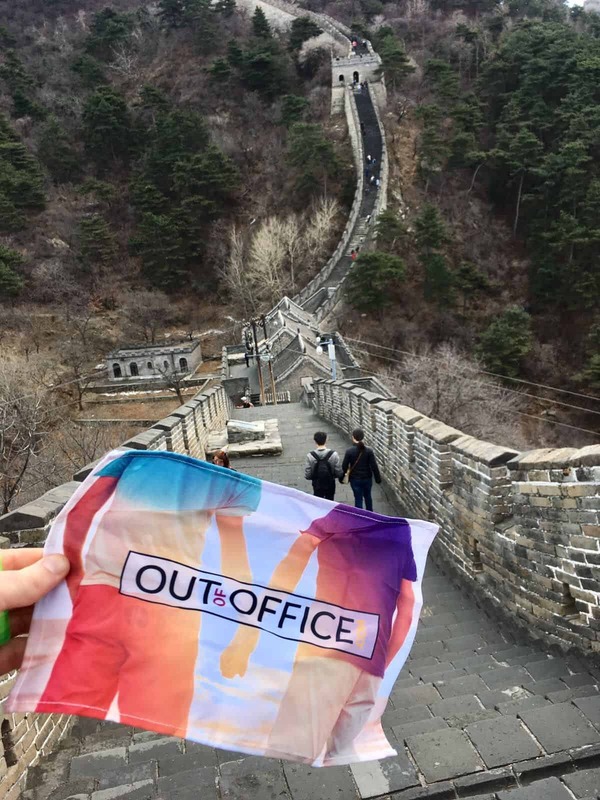 If the hiking seems too long after a while, you and your companions can ride the toboggan (optional) down the wall or have a picnic on the Great Wall. You will want to take some time to admire the wonderful rugged scenery. Soon after, you will return to Beijing and visit the Summer Palace. Otherwise a simple Imperial garden, the site was completely renovated by Emperor Qianlong during the 18th century to become one the most important sites of the capital. Afterwards, you will return to the capital. In the morning you will visit the famed hutongs (narrow alleys and streets of Beijing) near Houhai Lake. Then you will visit the Gulou, the Drum Tower where during the Ming Dynasty, the city marked the hours of the day with the rumbling of drums. The tower faces the Zhonglou, the Bell Tower, and gives visitors a glimpse of ancient Beijing. Sooner or later you will probably join in a mahjong party, a social get-together around Chinese Chess or card games. The number of elderly swells around these very popular games, a gathering where bystanders often come to watch and your guide can help explain the rules. You’ll then go to the station for your high speed train to Xi’an. When you arrive, your local guide will welcome you and provide transportation to the hotel. 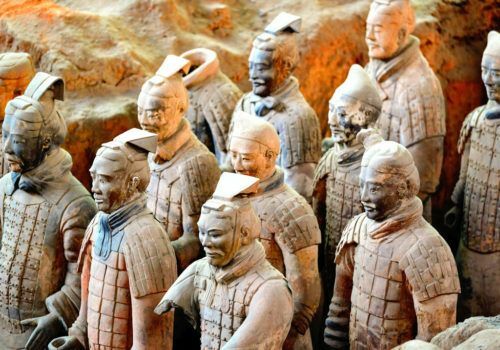 This morning you will visit the infamous Terracotta Warriors – about an hour outside Xi’an. In 1974, a few farmers stumbled upon the warriors by accident. Now, we can only wonder what those original farmers felt when they first laid eyes on the thousands of soldiers lined up in battle formation. They had just discovered one of the greatest archaeological finds in history. Certain practices during the Shang Dynasty (centuries before the beginning of the Empire) consisted of aristocrats and local kings burying people alive or sacrificing slaves before placing them in their future tombs or coffins so that they might serve their masters beyond the living realm. Afterwards, you will have a walk on City Walls built during the Ming Dynasty. Today, they stand restored and reconstructed and are a part of the fortifications still visible in China. You will visit the Chinese-style Mosque and the vibrant neighbourhood housing a number of butcher shops and different sorts of stores where men wear white skull caps and women wear colourful headscarves. At dinner, you will appreciate the unique ambience of a night market as you dine on the neighbourhood’s specialities of spiced lamb kebabs, flatbread and mutton soup with noodles. The day will begin with transportation to the airport and a visit along the way to the tomb of Emperor Jing, close to Xi’an airport. 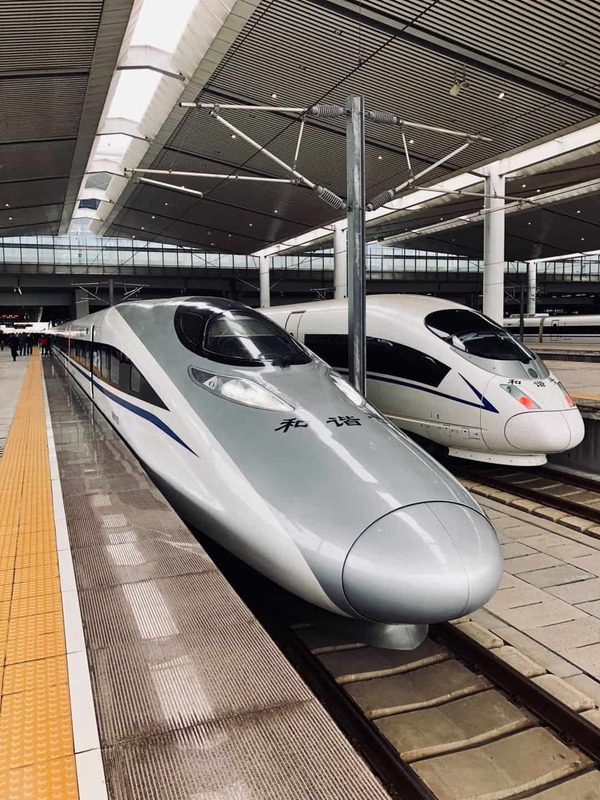 You will then fly to Shanghai where your guide will meet you and help you get to the city on the Maglev, an electro-magnetic train of the latest fashion and a source of pride for the Shanghainese. As you ride the train, you will be able to note the speed on a small monitor in each train car. The train can go up to 430km per hour. Then you will continue your entrance into the city with the subway at Longyang station (the terminal station of the Maglev) until Lujiazui station in Pudong district. On a separate note, your baggage will be picked up at the airport and directly transferred to the hotel while you enjoy traveling light into the city. Not long ago, Pudong district was just a marsh where only farmers and water buffalo frequented. Now, the area has become one of the most important business centers in Asia with skyscrapers popping up like mushrooms next to old Shanghainese banks each year. Stroll in Pudong district before heading to your hotel. We will start the day by heading to the People’s Square. From here you will head to one of the most famous and prestigious museums in the country, and in Asia: The Shanghai Museum. The collection of bronze statues is unrivalled, and is complemented by a number of jade pieces of artwork, as well as Qing Dynasty furniture, Buddhist sculptures and other pieces of Chinese artwork. The delightful People’s Park offers visitors an enjoyable place to relax at the heart of the People’s Square. The park has a small lake, a number of food stands and countless places to sit and enjoy the atmosphere. The area is surrounded by a number of cafés and restaurants. Then you will explore the famous Nanjing Road with its colorful signs and crowd of locals and tourists corresponding perfectly with the image of a modern Asian capital. Next you will discover the Bund, the city’s famous walkway along some of Puxi’s historical buildings. The area dates back to the 1930s, Shanghai’s rich culture and European influence. In the morning we will head for the French Concession, a symbol of a time when Western powers were accorded many privileges. You will start your trip with a stroll through Fuxing Park where you will have the chance to watch the Chinese practising their ritual of morning exercise. Especially worth watching are the tango dancers whose music fills every corner of the park. Afterwards you will wander the surrounding roads, admiring the old colonial homes that have now been transformed into restaurants, bars and different boutiques. During colonial times the French Concession was a no-go zone for the police and was home to gangsters, mafia, opium traffickers, prostitutes and people looking for a good time. Shanghai earned itself the title of one of the world’s vice capitals. You will continue on to Xintiandi, an entirely renovated area that is considered one of the liveliest parts of the city. You can end your walk at Tianzifang, a maze of animated alleyways full of restaurants, boutiques and small art galleries similar to those found in Xintiandi but much more authentic. Your walk will end in the Old Town, which today has mostly been rebuilt but which still has some of its old lilongs (which are like the hutongs found in Beijing) alive with the chatter of the Shanghainese and decorated with people’s washing strung out across the streets to dry. The Old Town also home to the famous Yu Yuan Gardens, a superb example of the art of Chinese garden landscaping, which is particularly common in this region. Traditionally Chinese gardens are a miniature reproduction of nature: the presence of rocks represents mountains, ponds represent lakes and running water imitating rivers. The quest for harmony takes precedence over the rigorous geometrical planning that you would see in most Western gardens. Their shape is therefore never rectangular, encouraging visitors to wander around with only their thoughts and no definite aim. Conclude the day with a visit to the local bazaar, where visitors and locals come to haggle. It’s a perfect chance for you to buy some souvenirs before your departure the following day, or take a rest at the Huxingting tea house, which is located at the centre of the lake opposite the Yu Yuan Park, and is one of the most famous in China. You will be transported to the airport and will take a flight to Osaka. Arrive in Osaka, where you will be welcomed by our airport representative who will assist you with transferring by either train or shuttle bus to your hotel. You’ll stay at the Gran Via Hotel in Kyoto which is one of the first in the country to conduct symbolic gay weddings. Alternatively stay at the beautiful Hyatt Regency. Explore the former imperial capital with a knowledgeable local guide, utilizing Kyoto’s comprehensive bus system to visit some of Kyoto’s World Heritage Sites. You will start your day with a visit to Nijo Castle. This ornamental castle was built by the founder of the Edo Shogunate as his Kyoto residence and is surrounded by stunning gardens. Continue on to Kinkakuji, the Golden Pavilion. Originally built as a retirement villa for the Shogun, after his death it became a Buddhist Temple at his request, and is now one of Kyoto’s most famous temples. The final stop of the morning is Daitoku-ji Zen temple complex, which consists of a main temple and 22 sub-temples. You will visit Daisen-in sub temple, which was founded in 1464 and has one of Japan’s best Zen rock gardens, perfect for a spot of Zazen meditation after a busy morning. After lunch, visit Kiyomizu (Pure Water) Temple. From the 13m high veranda jutting out from the Main Hall you can enjoy amazing views of the whole of Kyoto, whilst pondering the fact that both the Main Hall and Veranda were built without the use of nails or any kind of joiners. Today you will take the bullet train to Japan’s capital, Tokyo. Arrive at Tokyo station where you will be welcomed by our representative who will help you with your taxi transfer to your hotel. Today you will spend a full day taking in some of the many highlights Tokyo has to offer with a local guide by public train and metro. First stop is nearby Meiji Jingu, Tokyo’s most famous shrine, dedicated to the spirit of the late Emperor Meiji. The shrine is a popular site for Japanese Weddings; if you are lucky you may see a bride and groom dressed in traditional Shinto wedding attire. From old to new Tokyo as we then take a walk down Omotesando, commonly referred to as Tokyo’s Champs-Elysee. This broad, tree lined avenue features a multitude of fashion flagship stores designed by internationally renowned architects within a short distance of each other. A short subway ride will then take us to Asakusa, part of Tokyo’s Shitamachi, or old town. Asakusa is home to Sensoji Temple, Tokyo’s oldest Buddhist temple, and is also the city’s oldest Geisha district. The streets around Sensoji have many traditional shops selling Japanese crafts and souvenirs and are a delight to wander through. Today is a free today for you to explore this amazing city. Mix with the otaku (anime fans) and visit maid cafes in the electronics district of Akihabara, discover Tokyo’s world class museums and art galleries in Ueno and Roppongi, or get a glimpse of the future at Tokyo Bay’s Odaiba development. If you need a break from Tokyo’s hectic pace you can choose to make an excursion outside of Tokyo to the delightful seaside town of Kamakura. One of Japan’s former capitals, Kamakura is a home to many ancient temples and the Daibutsu, a giant bronze Buddha. Located just 1 hour by train from Tokyo, Tokyoites flock to the beaches here in the summertime. It’s time to head back home and we’ll arrange a transfer via train or shuttle bus back to the airport.